I always thought those Thorogood Roofers were sharp looking. Danner used to make some boots with that abbreviated toe box. I think it was one of their elk hunting boots. They might still make them for all I know. I used to see them in the Cabelas catalogs, and I haven't seen one of those in years. They also remotely remind me of the old Grafters Monkey Boots because of their height and look. I should add that Monkey Boots are the most uncomfortable shoe I've ever worn. Just got my Red Wing 608’s back from a factory resole. I love these boots. Very light and comfortable, although the sole wears more quickly than my Vibram soled 899’s. This is my second resole for this pair of 608’s. I read were people are concerned about the break in time for Red Wing boots, but you can keep resoling them so long as you maintain the leather uppers. So a little break in discomfort will yield many years of comfortable service. And RW 608’s require very little break in time. karlito, AbbaDatDeHat, dh66 and 2 others like this. Been wearing my vintage oxblood 1490 docs today. Bought these approx a year ago, NOS vintage made in England. I reckon they were made sometime early 1980's. Dm101, bluesmandan, A-1 and 6 others like this. Really? I've always laced my boots that way. Quickest way i reckon,basically it's just like sewing them together rather than faffing out with alternate left / right. Mich486 and AbbaDatDeHat like this. Colin G, A-1, AbbaDatDeHat and 1 other person like this. So i use the shoe shop / factory lacing then. Who knew?? 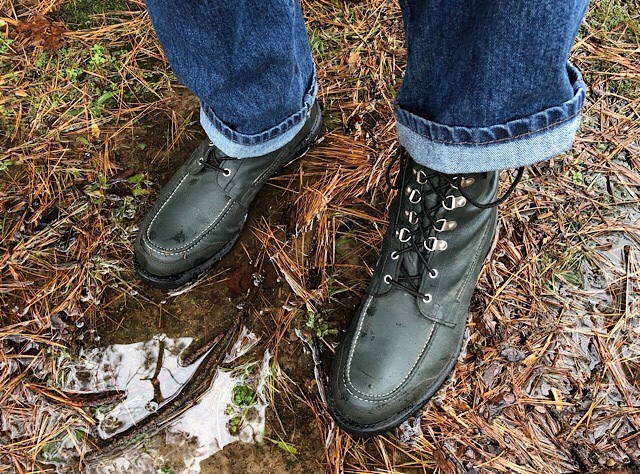 Danner still offers them. I have a pair of their Ft. Lewis boots which used to be called the Ft. Lewis "Go Devil" boots. They offer some other models similar to this which we referred to as 'lace-to-toe' boots. I owned some Herman Survivors back in the late 70's that were similarly constructed. I know you're familiar with these. BobHufford and AbbaDatDeHat like this. Innocent Kid, can you post a step by step on how to achieve the horizontal/parallel lacing? Not so innocent old man. No. Bamaboots, I was address the user Innocenti Kid. Geez...i just looked at all 57 of these now i’m dizzy!! The real question is whether you are tying your boots/shoes correctly. Do you think you are? You are probably wrong. For 2019 start doing it the right way. I found this out a year ago and now I don't have to double knot. Another good reason to wear cowboy boots. Colin G, AbbaDatDeHat and dh66 like this. Back to work so back to my daily wearers. Solovair 11- hole derbys. Approx 14 months old. I spend a round 10 hours a day in these 5 days a week walking around 5 miles a day all through the Autumn / winter / spring months, so they'e done about 700miles! AeroFan_07, Dm101, bluesmandan and 6 others like this. Breaking out and breaking in a pair of new Browning kangaroos that have been in the back of my closet for probably 20 years. handymike, Duck, A-1 and 3 others like this.